We've got spooky spirit, how 'bout you? Get ready to show off your creativity and skills! 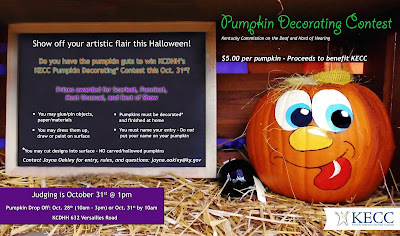 The KCDHH pumpkin decorating contest is almost here. Have you begun planning your entry? There is a $5.00 entry fee per pumpkin. Proceeds go to benefit KECC, so enter more than one pumpkin for more chances to take home prizes and the glory!